January 28, 2015, Prescott- This afternoon, as I was readying for my drive up to Colorado, I got a call from my street-smart buddy, wanting me to look at something. I met him at a used car lot, mentally preparing for yet another misadventure. What I found, though, was that he had found, and arranged to buy, a treasure. A 1995 Ford van, complete with solid wood consoles, and a small 8-cylinder engine, was his, for a bargain price. He started it up, and I did my usual in such matters- kicking the tires (good tread and solid wheels), checking the exhaust pipe, manifold, belts and hoses (all good) and the fluids (topped off and clean). He seems to have done well. This set me to thinking. Many of us complain that there is little made to last, any more. Here is a prime example, though, of a vintage model that has held up well, after nearly twenty years. I am of the opinion that young people will revive the notion of building things in a solid manner. We already see artisan products- foods, beverages, and various crafts, all being made with pride. I think that artisan products will expand, in number and in scope, as the need to ditch the concept of planned obsolescence gains momentum. Relationships, too, will increase in the number of “vintage” long-lasting bonds. We may not see traditional marriages increase in number, but I have observed a larger number of couples who are committed to one another. I don’t think it’s just old Bruin wearing rose-coloured glasses. Young folks want security, and where better to find such, in the days of the scaredy-cats on Wall Street selling other people’s funds at the drop of a hat, or of the proverbial sky, than with a long-term partner. As some things fall apart, other things will emerge and be the foundation of the future True Vintage. January 27, 2015, Prescott- Pop would have been 91 today. That he made it to 90 years, 4 months and 10 days, before returning to the Spirit Realm, last year, was the prime force of his indomitable will. He showed his Nazi captors, various other bullies throughout his life, and all of us who came to be his trusted circle of family and friends just how adversity ought to be handled. The Universe gave that man’s man three girls to raise. He gave that task his all, as any father worthy of the name, would have. All three, two of whom are twins, were unique individuals, and Pop played to their strengths, challenged their weaknesses and gave them a secure framework for growing into women of achievement. His eldest, my late wife, Penny, achieved three Master’s Degrees, a thirty-year career as a classroom teacher and showed her own triumph in dealing with a lifelong illness, which only brought her down after she had made her mark and touched the lives of hundreds of young people, across the globe. Her sisters have worked hard and proven themselves indispensable in their respective businesses- which have run the gamut from telecommunications to equestrian training. Horses were, in fact, central to the Fellman family’s life. Riding, both English and Western, was a family trademark, and was one of the endeavours that brought Norm back from his end-of-war near-death status. That, and the equally indomitable will of his wife of 65 years, gave him the lease on life that made his influence on so many of us, such a force of nature. He was a pilot and a motorcyclist, which the ladies respectfully declined to take up for themselves. Horses, dogs and cats, though, remain essential- and Pop was never without at least one of the three within calling distance. He imparted that love of animals to his daughters, and none of their houses have been without pets. Men are indispensable to their girls. Both parents are indispensable to all of their children. I never had the honour of raising a daughter, but as a proud parent of a an American sailor, I would be fully engaged in the lives of any grandchildren he may sire, in the future. Norman David Fellman set that mold, both as a father and grandfather. His pride in each of his girls was infectious, in the best of ways. The mold will not be broken. January 26, 2015, Prescott- An asteroid, replete with its own tiny moon, zipped past us today. As our area was overcast, no one here would have been the wiser, had it not been for the media making several references. Apparently, Russia, Australia and the midmost Pacific Ocean were all spared, as was the rest of the planet. God knows, we need no more extinctions or disasters, given that there are plenty of both happening, almost on a daily basis. The last five Northern White Rhinoceros are being prepped for DNA extractions, in hopes that a female Southern White Rhino might be a surrogate mother of an IVF Northern White Rhino baby, or two. In order for the population to be restored, however, one would imagine the process would have to be repeated at least four more times. I mention this, because we tend to think of life as being subject to human whim. This is a peculiar narcissism. Life happened so long before any creature resembling us was more than a part of the Creative Force’s long-range plan. We have the power to undo so much, though, that I shudder at the tendency of some to look at profit as the sole determinant of who, or what, lives and dies. Mass extinction, though, would seem to require far more. It could be that someday the planet will be visited by an orb large enough to bring about a “night” of three to six months. There will, no doubt, be human and animal survivors of such a dreadful occasion, just as there were animals which thrived, even after the asteroid which most likely precipitated the demise of the dinosaurs, as the fossil record revealed them to be. Through it all, I hope that people will look upwards, at the noonday Sun and at the bright moon and stars of night, and remember that, as life was generated, seemingly from nothing, so many eons ago, any acts of ours which extinguish one living flame will be answered by a new torch of life. 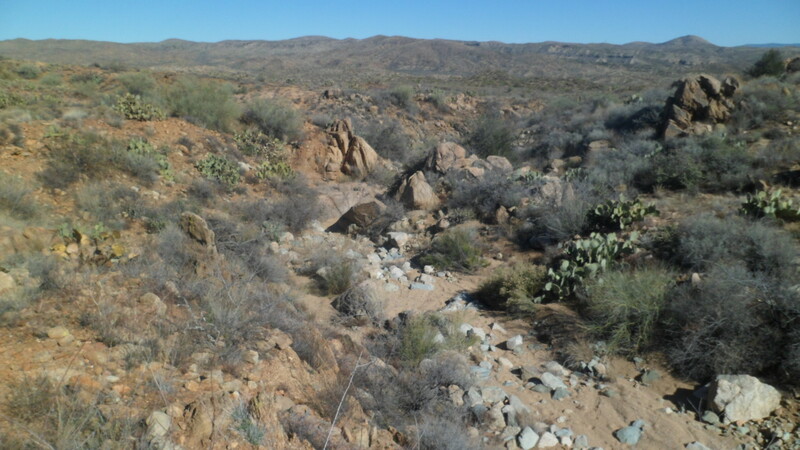 January 24, 2015, Bumble Bee, AZ- I found, late this morning, that I had previously reached the trail head of Antelope Springs- Hidden Treasure segment of the Black Canyon National Recreation Trail, which I am determined to complete, in segments, during this calendar year. 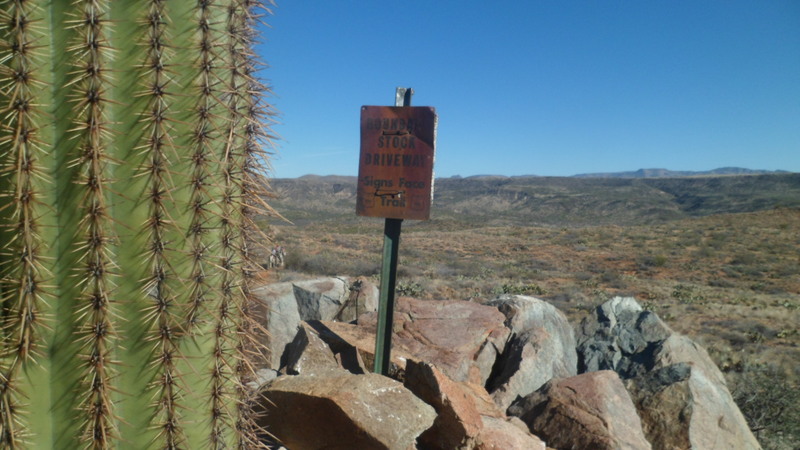 Gleefully, I headed out from the large water tank that marks Antelope Springs. 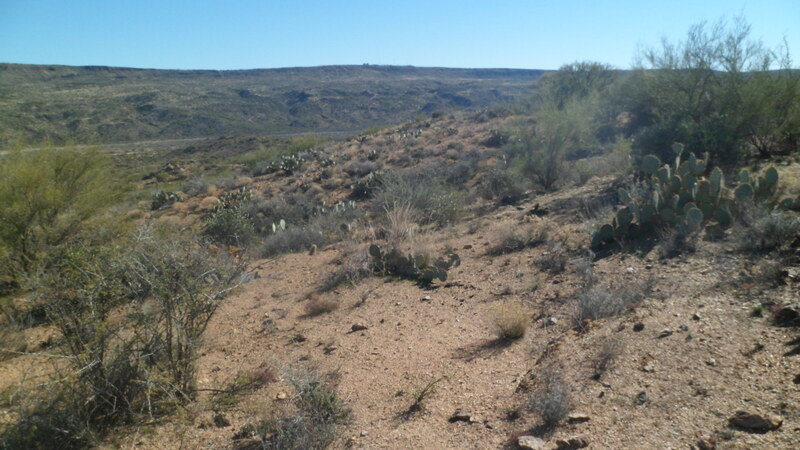 The first mile, or so, of the trail is easy, flat and distinguished only by what is probably the northwesternmost sahuaro in Arizona. All was quiet, too, which gave me the solitude I craved this noon, after a week of earnest service to a homeless veteran and a class of Special Needs students. 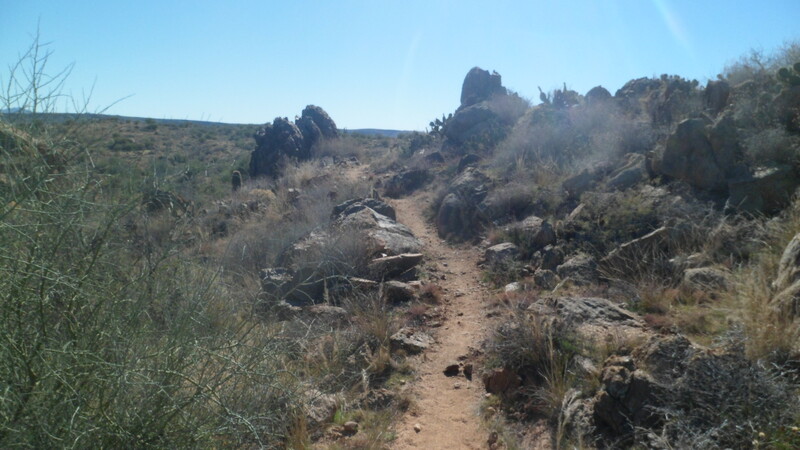 While the trail stayed sanguine, the rocks were the star attractions. 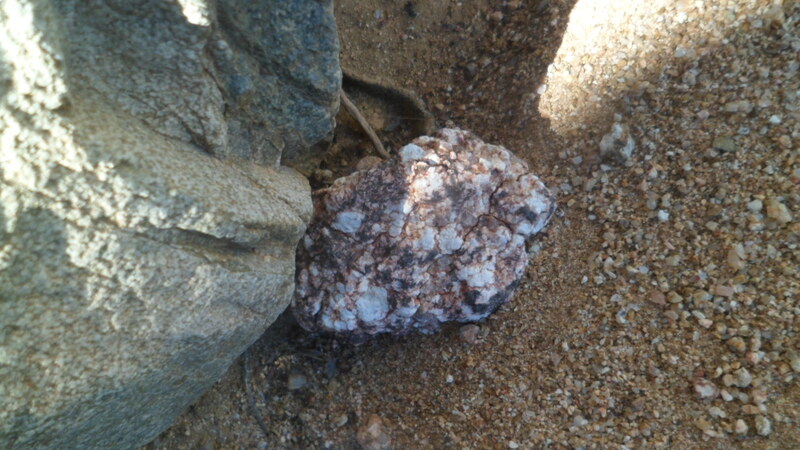 Smooth quartz, mostly milky white, was dispersed along the way- with a couple fields of shattered shards. Other pieces were marbled with granite, or infused with iron. 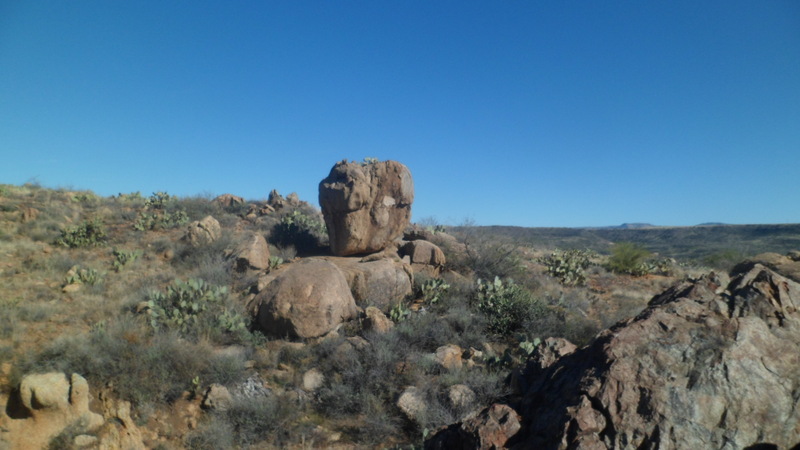 A surprise came, around the first mile point, in the form of a large boulder of blue granite. Then there were lots more broken bits of silica. 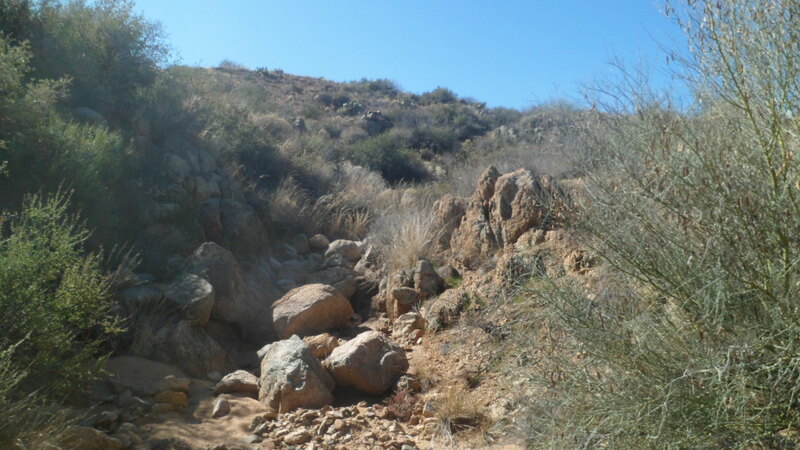 The trail began to get more rugged around the area where Hidden Treasure Mine was supposed to be. 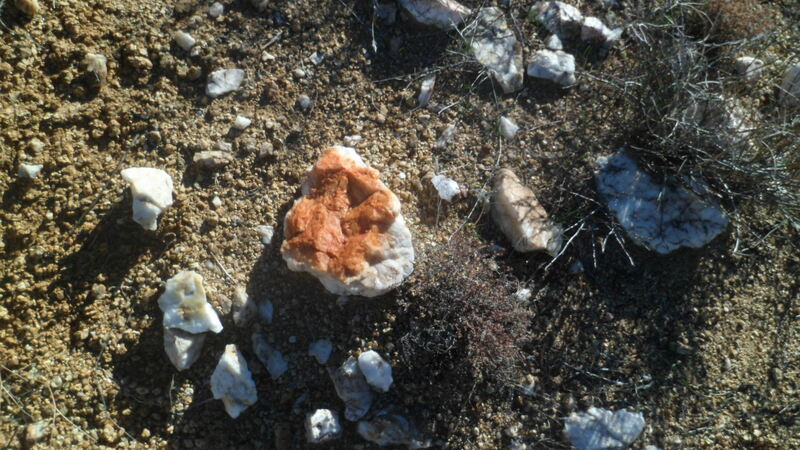 I found no indication of the mine, which is probably just as well. I did find an ominous hooded figure, but it was merely a standing bit of granite. 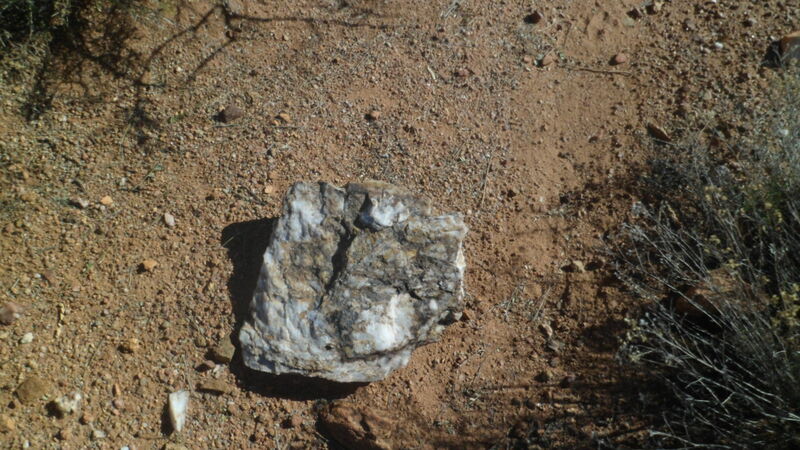 In Government Canyon, where I took a brief rest, around Mile 4, I saw a marbled granite gem. The trail kept on rising, then began to descend towards Bumble Bee and Bland Hill Road, around Mile 5. Sahuaro are a bit more numerous in this area, and face the ravages of being approached by the occasional errant horse, or human. There were plenty of both along the trail today. It was a gorgeous day, and about two dozen horses, with both Western and English riders, happened along. 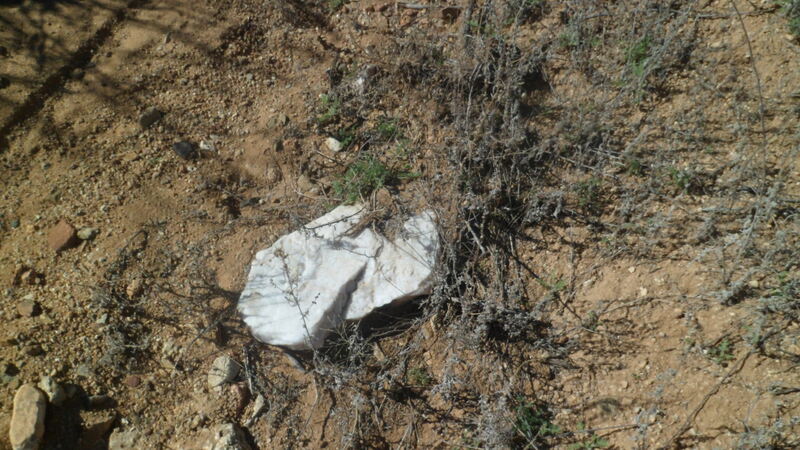 I picked up a shoe that one of the animals had lost, and the group later gave it to me as a souvenir. About eight bicyclists also enjoyed the trail. 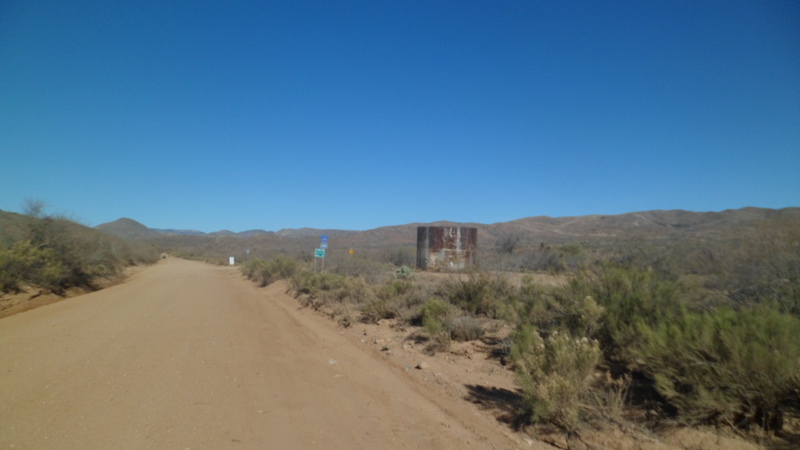 I took note of the next starting point, at mile 6.2, just a mile or so west of Bumble Bee, an old mining town that is now home to about two dozen intrepid families. Off to the southeast, and up on a steep hill, I could see Sunset Point, the major highway rest area, on I-17, between Phoenix and the turnoff to Prescott. 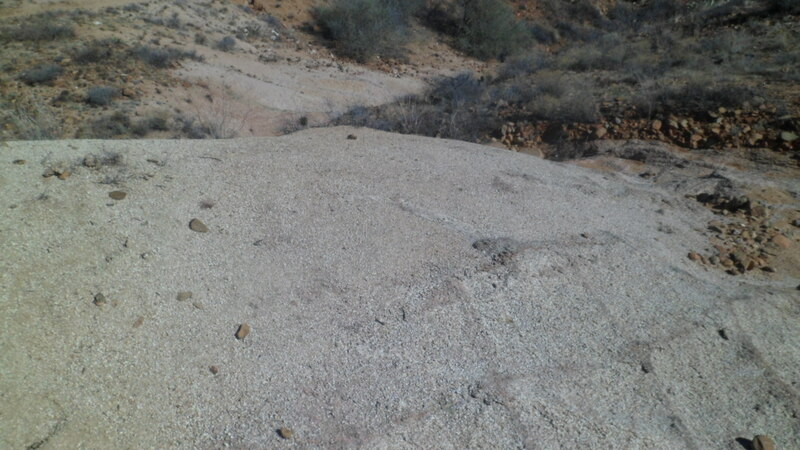 Heading back to the water tank, I spotted twoformations, in different light. 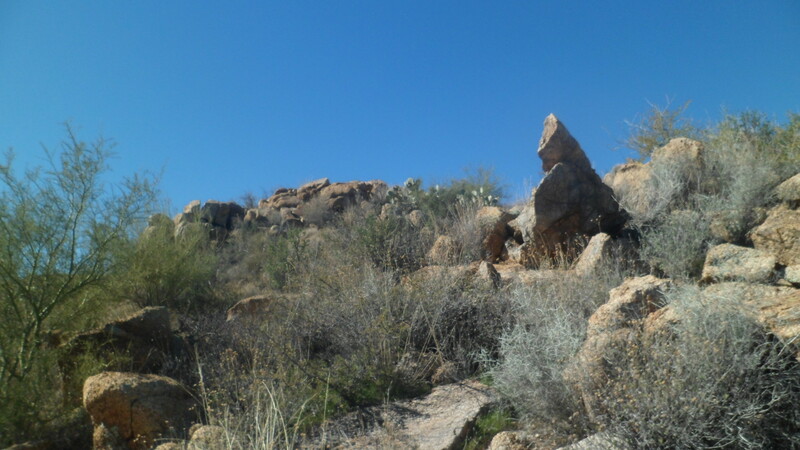 This outcropping contained a marker for stockmen to keep their animals in single file, as if they needed any such cue, on this trail. So it went, that I completed not one, but two, segments of this well-worn trail. Next segment will take me from Bumble Bee to Black Canyon City, sometime in late February. January 23, 2015, Prescott- Over the past several years, I’ve learned it’s best to hold high expectations of my own performance and behaviours, while not expecting specific acts of others. I’ve mentioned this before, and of course, taken flack from those whose view is that we ought hold each other’s feet to the fire. The problem with that is, burnt soles make for hard walking. I am working with a transient man who has rejected all solutions, thus far, regarding his getting permanent housing. I sense he’d prefer to be out of doors, permanently and that’s fine. I have pointed out, though, that others who are helping him. and I, are not available 24/7, given our other responsibilities. He is congenial about that, and doesn’t give us any flack. There is one thing about expectations, though. High hopes are admirable, yet need to be tempered with patience. Keep your sights high, dream big, AND prepare to move forward slowly. The progress of mankind will be constant, yet tempered by setbacks, largely due to the scarcity mentality of the financial sector and other aspects of commerce, by the limited understanding and fear of change that affect both the guardians of the status quo AND those who say they believe in new ways of doing things, even as they also believe that the bottom has to drop out of those new systems, eventually. I believe that our expectations will lead to our future. If you think that God provides, “kind of, sort of”, then you will get exactly what your doubt and fear are telling you will be provided. If you believe that while, yes, it’s cold today, people might die, tragically, tomorrow and there may well be fires, earthquakes, tornadoes, floods and cyclones in the months and years ahead-maybe even WWIII, there will be civilized life beyond all those, then your efforts will be towards recovery and regeneration, not the doom and gloom of virtually every current religious and political system presently operating. When the latter happens, are the pessimists going to be pleasantly relieved, or will they still look under rocks for “dark days ahead”. Expectations do best to seek the light, even that which lies beyond the storm. January 22, 2015, Prescott- I got a call at 5:38 AM, got out of bed, fumbled with the phone, hit the wrong button, and ended up with no work today. It always goes the way it is supposed to go, though. While I won’t earn money from today’s activities, I did reassure a transient friend that he has allies in this community, got him where he needed to go, and spent some time with a friend in Prescott Valley, at a restaurant on the north side of the sprawling town. The place is called The Chalk Board. It’s a breakfast and lunch spot and has an inventive, well-prepared menu- like Soldi, here on the hilltop. Several of us will probably gather there on Saturday morning, for breakfast. 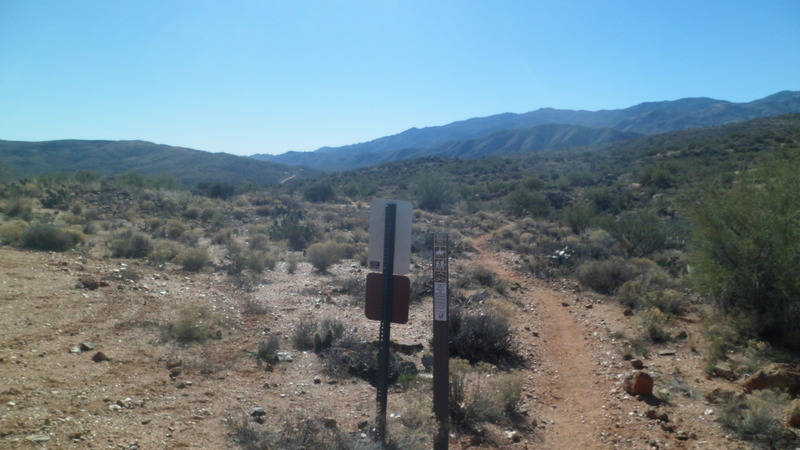 I want to look for the trailhead where I left off of the Black Canyon Trail, last Spring, so a hearty breakfast, en route, will be a great start. Work- The full-time job will happen, if it’s meant to, by the end of February. Otherwise, I will show up at every charter school in Prescott and Chino Valley, give them each a copy of my sub certificate, focus on building my Essential Oils business (which I’ll do, anyway) and sock money away. Service- I am with the Red Cross as a volunteer, regardless. American Legion? My continuing there, past May, will depend on the political climate. Right now, it looks iffy. Prescott Family Shelter is on my volunteer radar screen, also, unless I get full-time work. Recreation and Travel- Colorado, next weekend, is my most immediate focus- for a Winter Summit. Texas, the Gulf Coast and central Florida follow, from Feb. 6-17. My MIL has a birthday during that time, in Leesburg. 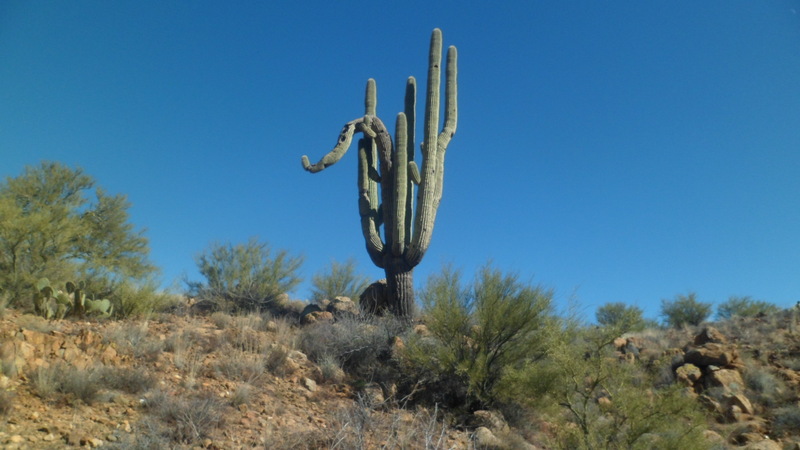 Weekend hikes will be many, from mid-February until late May: Continuing down the Black Canyon, McDowell Mountains’ Pemberton Trail(Scottsdale), Spur Cross Ranch (Cave Creek),Kendrick Peak (west of Flagstaff), Tucson’s Sahuaro National Park-West Unit, a few more places in Sedona and the rest of Tonto Natural Bridge State Park’s trails. Then, there are the hikes I will no doubt take, on the spur of the moment. Faith- Baha’i, like random acts of service, makes up the built-in cabinets and shelving of my Life House. My growth, and that of the community, will continue in tandem with all of the above. These may seem like trifling challenges, and they are. Then again, I’m autistic. Everything is a challenge. January 20, 2015, Prescott- “We may have arrived on different ships, but we are all in the same boat.” This was one of the messages being carried by the some 400 marchers in Prescott, AZ, yesterday, during the Martin Luther King, Jr. Day march, from Prescott College around Courthouse Square and to the United Methodist Church, where a rousing rally, with gospel music and a stirring address by Reverend Michael Cannon awaited our assemblage. My parents raised us to regard each person we met, on an individual basis. They were prisoners, somewhat, of their generation’s tendency to fear “the other”, but my folks desperately wanted out of that box, and looked to us to show the way towards a more inclusive world. There were classmates of Asian descent, in my high school, who were congenial. I did not, however, have friends who were African-American or Hispanic until I was in the Army, and it was much later that my circle grew to include Native Americans and people who hailed from the Middle East. We are in a far more open world now. My son does well with people, regardless of ethnicity, faith or sexual orientation, as do I. The Baha’i Faith, to which I adhere, enjoins anyone from acting out of prejudice. Our task is to root out the bias and replace it with an understanding of the people whose backgrounds differ from ours. The thing to be opposed, in this great Age, is an unseemly character. That was the bedrock of Dr.King’s speeches, and actions, in the 1950’s and ’60’s. It was the overriding theme of Rev. Mr.Cannon’s address, yesterday morning and again last night, at St. Luke’s Ebony Christian Church, where he is Associate Pastor. It is the foundation of that which every person who seeks uprightness in this life, does every day. Imperfect souls own their flaws, and still march towards the light, casting the burden of foulness aside as they go. I know of many people, myself included, who have aspects of their past which, if left unaddressed and uncorrected, would serve as a personal Tar Pit. On we go, though, grateful for forgiveness and grace. This is huge boat, and we each have a part to play in its successful voyage. So, if you are African-American, come to the table. If you are a lower-income, or lower-middle-class person of European descent, come to the table. If you are of a family indigenous to these continents we call America, come to the table. If you are from the world’s most populous continent, anywhere from the eastern Mediterranean to the western Pacific, come to the table. If you came from Africa, during the past century, or from Australasia, come to the table. You may be, like me, attracted solely to the opposite gender- and you belong here. You may be drawn to those of the same gender, or both, or may feel you need gender reassignment, or already have had it- and you belong here. Regardless of age, ability level, or employment status, you belong here. Whether you are Liberal, Conservative, Moderate, Tea Party or Occupy Anything With A Corner Office, you have a part to play. We need to uphold the rule of law, AND the law has to be humane. We surely need to expect those entering our country to respect and obey our laws, just as those of us Americans who visit other countries must adhere to their laws. We do best to remember that the task of the individual is to show mercy, and that of the human institution, from the family to the nation-state, is to show justice. The great boat will not list, will not leak and will not sink, so long as we all remember: Each has a place. January 19, 2015, Prescott- This morning was taken up with a short march from Prescott College, to a circumambulation of the Yavapai County Courthouse, then to a nearby Methodist Church. At the church, there were bagels (“California-style”, which means untoasted), cream cheese and assorted fruit, with choice of hot beverages. We then enjoyed a fine performance by the St. Luke’s Ebony Christian Church Choir, from Prescott Valley, and an address by their pastor, Reverend Michael Cannon. Dr. Martin Luther King, Jr’s brief life of intense public service is the impetus for this day being held up as a National Day of Service, and Mr. Cannon’s admonition was for each of us to examine our own commitments. He himself sounds like a man who lives each day in such commitment, judging from the accounts of others. I have committed myself to acts of service to others, for some time. Many of these are part of an organized effort. Others are spontaneous and random, as a given day unfolds. I don’t really see myself as selfish; nor as a hero. Day by day, each of us can serve others, from the unsung acts of a dedicated parent, or caregiver, to the First Responder working to bring peace to a disastrous scenario. There is one thing about service, though, that needs to be borne in mind. It cannot be forced, nor can it be smudged by those who impose the pain of guilt on others. Last night, several of us were given an indirect message that we were not doing enough to ease the plight of the homeless, and of a few shut-ins who live in a nearby community. My reaction is, there is always more to be done, in a suffering world. It cannot, however, be imposed upon us from the masters of guilt. I trust that everyone who has good in their hearts will work, in some way, to relieve the suffering of those around them. So it shall ever be.